The SAFLOK™ MT™ is a multi-technology locking system that provides properties around the world with added levels of security and greater efficiency. The non-volatile FLASH circuitry stores over a year’s worth of lock data (or up to 5,900 entries) providing detailed audit-trail information, such as date and time of the entry as well as the ID code of the employee or guest using the keycard. The MT™ lock is easy to use and works with the Windows-based System 6000™ and DeskLinc™ front desk systems. The MT lock’s battery pack is welded and insulated to ensure uninterrupted power. If the battery power is running low, it will alert you months in advance by displaying a red light when a keycard is inserted. This gives you ample time to replace the battery. During the change-out, the programming and audit trail information remain intact. Another benefit of the MT lock is that it is easy to upgrade without changing or removing hardware. New software features can be easily uploaded when desired upgrades become available. The MT lock can be programmed to lock and unlock at certain times of the day, allowing entry during “passage” hours and relocking during secure hours. 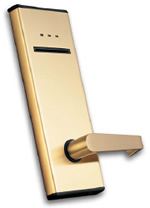 This feature makes the MT lock ideal for perimeter, meeting room, and amenity area doors. Optional Automatic Dead Bolt (ADB™) The SAFLOK automatic dead bolt features a two-point locking system. The 3/4” deadlocking latch and 1” steel-reinforced dead bolt activate every time the door is closed, providing increased protection against forced entry. The MT lock is also available with a mechanical override key (MKO). When the key is used, a line is added to the locks transaction history log, and can be traced back.